May be a creek crossing on beach at Bellingham end during wetter months. No facilities provided. 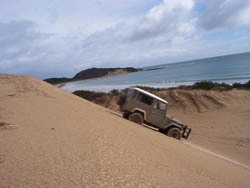 best to travel with another vehicle and have basic recovery items, as sand can be quite soft in places. The track is actually called St Albans Bay and goes from Bridport to Bellingham and is best traveled in that direction.